Dare you enter a world of Wizards and darkness? Over at our children’s imprint, The Repository of Imagination, we’re publishing an entire trilogy in one go. 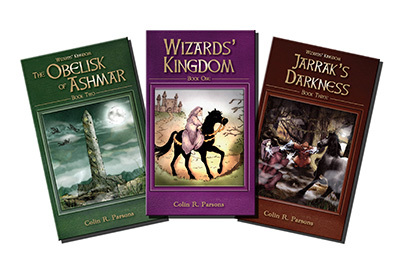 This is Wizards’ Kingdom: a classic good vs. evil adventure series that author Colin R. Parsons intended for 8-12 year olds, but we’ve had to set a suggested reading age of 8-80 as the grown-ups can get enough of the books. TallyBerry Publishing has been selling thousands of these in paperback in the UK. And now the Repository adds to that by launching high quality kindle editions that faithfully reproduce the dozens of internal illustrations by Derek Jones. This entry was posted in Book launch and tagged children's fantasy book, children's fantasy series, fantasy trilogy, wizards. Bookmark the permalink.